This module does one thing only: it activates the mouse control to function within the Score editing frame. When activating any Macro Express module, mouse control switches over to the Windows side (both Macro Express and DosBox are Windows programs; hence the switch), which means that in order to continue working within the Score editing frame after any Macro Express module has run, the user would first have to click within the edit area in order to reactivate the Score mouse control before being able to select any item in the Score edit area. The macro assumes that the user will often prefer for mouse control to remain within the edit area upon executing any Macro Express module while working in ScorBox. 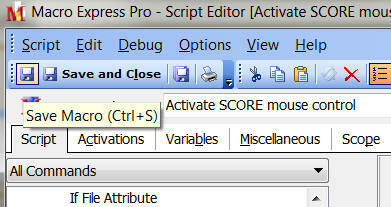 In essence, Macro Express performs the mouse click necessary in order to reactivate the Score edit area mouse control. This macro is called frequently by other Macro Express modules. Note that the “Scope” of this module is “Global,” as this allows the module to be executed no matter which application is active at the time. and try different X and Y coordinates, until, when activating the macro, the mouse moves squarely inside the Score editing frame (each time you change X and Y coordinates to try new settings, you have to save the macro to apply the changes). 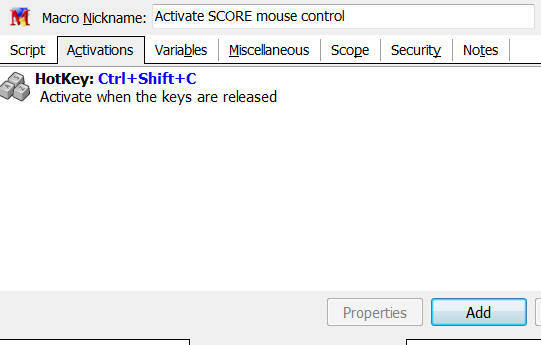 Once you are satisfied that the mouse move now predictably falls inside the editing frame, delete the hotkey you’ve assigned for testing the macro (remember, this macro is activated only by being called from within other macros), and reactivate lines 2 and 3 in order to enable the mouse click. Then save again, and you’re done.